Please write correct digits from your receipt number. Please provide a valid receipt date. Select correct processing type for your case. As more people share their case details, everybody gets to see more information. Help by adding your case. USCIS EAD processing time varies between 1 month to 6 months. EAD applications filed on form i-765 can be for different types of employment authorizations. 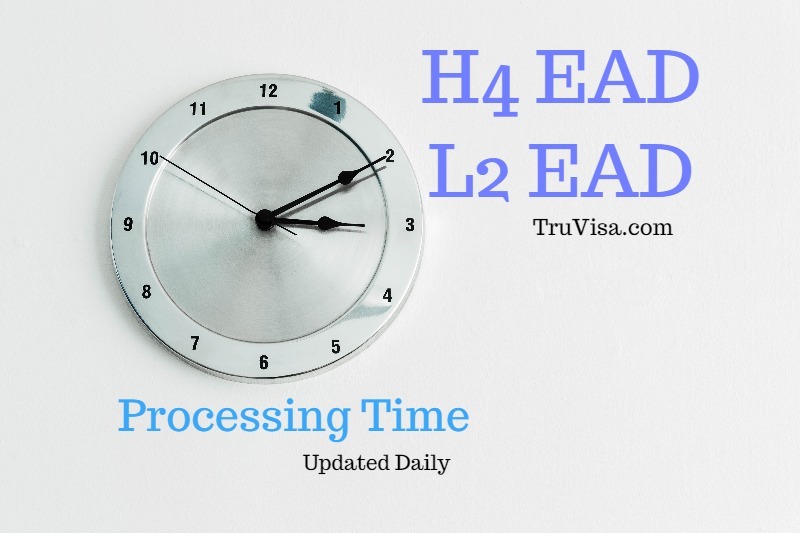 The EAD approval processing timeline for both new and renewal or extension requests is given above for all H4 EAD, L2 Visa EAD, I-485 adjustment of status pending EADs at all USCIS service centers including National Benefits Center. The best case scenario is the most recent EAD approval that we have found using data from various user driven forums and online trackers. The final dates have been merged with USCIS official data to give you a reliable average EAD processing time. If your ‘case received date’ is before the date mentioned above, you should raise a service request with USCIS to check why your case has been delayed. This could mean that your case is taking longer than other similar cases and may be stuck in administrative processing. How long does it take for EAD to come? The normal USCIS processing time is mentioned above for each service center. How do I check the status of my EAD application? You can use USCIS case status check website to get the status of your EAD application with your USCIS receipt number. Can I work with approval notice for EAD? You cannot start working until you have received your EAD card. How long does it take to get EAD card once approved? You should receive your card within 5-7 days once the status of your EAD application shows as ‘Card sent for printing’. There are no USCIS service centers named Dallas or Phoenix. You just send your applications to lock-boxes (mail box) located in Dallas and Phoenix. After that, USCIS routes your EAD application to actual service center. Check your receipt number to find which service is processing your application. It usually takes 60-90 days to process and approve EAD application after you have submitted RFE response to USCIS. The count starts from day USCIS receives your RFE response. 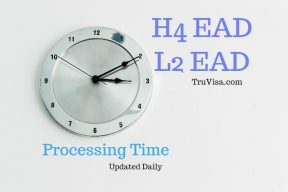 Make sure your primary visa like H1B (or L) has at-least 6 months of validity before applying for dependent H4 EAD to avoid a certain RFE. How long does the SSN card take to arrive if applied with EAD application? The SSN takes about 4 weeks to arrive if your EAD has been approved and you had opted to get SSN with your EAD application. If not applied with EAD, you have to apply SSN separately after you receive your EAD card. Hi Anil, thanks for the work you have done with this website. Very helpful! My received data is 12/13/2018, and my notice date is 12/22/2018. Does the clock starts on the received date or on the notice date? The clock starts on the receipt date mentioned on your receipt notice. Hey Anil, apparently processing times were increased https://egov.uscis.gov/processing-times/ now shows an additional .5 months for each processing time, for the california center anyways, haven’t checked the others, do you know if this affects applications filed prior the increase date? It would affect all applications. Hello, my EAD is based on the i485 form and was received Sept. 27, 2018 at the National Benefits Center. When can I expect my card? Please use the timing mentioned above to estimate your card approval. USCIS received my 485 application on Oct 25, 2018 (RD) and its with National benefit center. My status still shows “Fingerprint review was completed”. When do think I will get my EAD card? its been more than 5 months now. Please use the estimated timelines given above to get an idea. hmmm…With above time, it looks like I may not get until end of May. Hope my guess is right. Anil, the best case scenario for ead/ nbc shown here is in November right now (I recall it previously by the end of December, but you said wrong data was removed). However, by watching immihelp forum on a daily basis, I do see some people getting approved in December (e.g. 12/28), what makes me think your old data was more accurate. My suggestion is that you double check the criteria you are using to delete the data. Just a heads-up! Love your work by the way! Congrats! The problem is that many case status do not get updated on USCIS site and then if our service tries to verify, it removes the record that it could not verify with USCIS. We will check if we can do anything to verify the record using other methods too. The service is still new and we are making it better using the examples like you have shared. Thanks for writing in. We appreciate it. I have not yet moved to US, but wanted to know if we can apply to specific service centre or application goes to random service centre. I will be applying from Washington. Applications do not go to random center. You cannot choose a center yourself either. USCIS has address based service centers to process applications. can i ask somehow to switch my case from CALIFORNIA SERVICE CENTER to another service center which is faster? No, you cannot do that. If that was allowed, everybody would have requested to change service centers. Yes, it will affect dates. Please try to estimate your dates yourself too based on the average dates mentioned above. I cannot help with the processing time. Can i apply for jobs and attend interview as i have applied for EAD and it is under process ? You can apply for jobs but cannot start work until you have got your EAD card. Thank you so much anil .